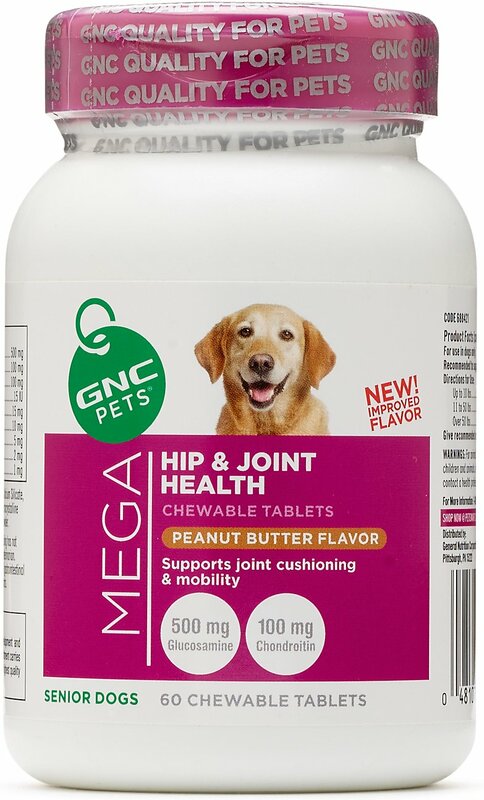 Keep the spring in your dog's step with GNC Pets Ultra Mega Hip & Joint Health Senior Peanut Butter Flavor Chewable Tablets Dog Supplement. This premium chewable tablet is an easy-to-feed, peanut butter flavored hip and joint supplement that's formulated with high-quality ingredients to support connective tissue and help maintain normal, healthy joint function in senior dogs. It includes glucosamine, which helps maintain joint function, as well as chondroitin and MSM. Made with a new and improved flavor, so it's sure to have your dog's tail wagging. Chewable tablet is an awesome alternative to pills, making it easier to supplement your dog's joints. Active Ingredients: Glucosamine Hydrochloride (from Shellfish) 500 mg, Chondroitin Sulfate (from Bovine Cartilage) 100 mg, Ascorbic Acid 100 mg, Vitamin E 15 IU, Zinc 15 mg, Methylsulfonylmethane (MSM) 10 mg, Manganese 5 mg, Copper 2 mg, Hyaluronic Acid 1 mg.
Inactive Ingredients: Artificial Peanut Butter Flavor, Brewer's Yeast, Calcium Silicate, Cellulose, Gelatin (Fish), Magnesium Stearate, Manganese Sulfate, Microcrystalline Cellulose, Poultry Liver, Povidone, Silicon Dioxide, Stearic Acid, Whey Powder. GNC Pets premium solutions support the health and wellness of dog companions. Every product is taste tested and approved by fellow canines, and designed for them right here in the USA. With their unmatched ingredients quality, potency and honest labeling standards, GNC Pets is a trusted brand that has earned the National Animal Supplement Council Quality seal of approval. Canine companions, just like pet parents, can use some extra support during life’s unpredicable events such as traveling, spending time away from their pet parents or from everyday environmental stress. GNC Pets provides solutions for these moments like their Ultra Mega Calming Formula Soft Chews, which help to soothe and calm pups, all while providing them with a delicious beef flavor they love. As dogs get older or experience weight gain, it’s not uncommon for hip and joint issues to arise. GNC Pets joint and hip formulas such as their Ultra Mega Hip and Joint Health Bacon Flavor Soft Chews may help support mobility and joint function. GNC Pets multivitamins support canines of all ages with the vitamins, minerals, antioxidants and omega-3 fatty acids they need to thrive. Best of all, they are available in beef-flavored chewable tablets. With GNC Pets, adding multivitamins to your dog’s daily diet is easy. Dogs need help with digestion too, which is why GNC Pets created a variety of options to provide good bacteria in your buddy’s gut. Not only do they contain probiotics, enzymes and other key ingredients to help support your furry friend’s digestive health, but they also come in tasty flavors including pork and beef. GNC Pets offers a variety of medicated and hypoallergenic products for sensitive pups that help to support their fur and skin health. Not only will your furry friend feel great, but she will look and smell great too. Whether you choose to support her health from the inside out or directly from the outside, GNC Pets has a variety of edible and topical solutions to help her feel her best. Calming Solutions: Convenient calming solutions to help ease environmental stress. Ear Care Wipes: On-the-go cleaning that supports good ear hygiene. Fish Oils: Purified oils to provide essential fatty acids for skin and coat health. Hip & Joint Support: Convenient mobility support that encourages joint health. Medicated Shampoo: Antiseptic and antifungal shampoos to relieve various kinds of skin discomfort. Milk Replacer: Convenient calorie and nutrient-rich formulas for healthy growth. Multivitamins: Essential vitamins and minerals in easy-to-feed formulas. Tear Stain Wipes & Whitening Shampoo: Products to maintain the shine and luster of white and apricot fur types. Weaning Formulas: Convenient nutrition to help transition puppies to solid food. Since 1935 GNC has paved the way in health and wellness and now continues to do the same in the pet industry. 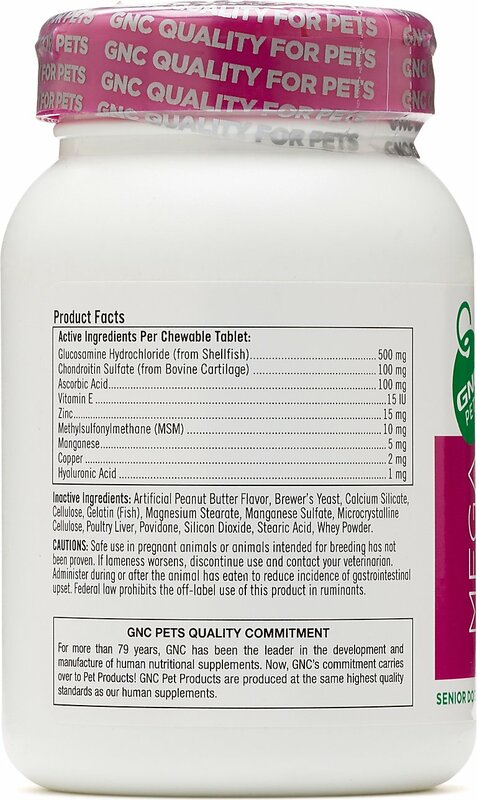 GNC Pets provides solutions to support the health of cat and canine companions for head to tail well-being. GNC understands that pets are family too and therefore deserve the same premium ingredients, quality and care as their pet parents—because when your pets live well, you live well. I have an american bulldog she is 11 and she takes them just like treats.